Cats cannot brush their own teeth. This may seem like stating the obvious, but there are a huge number of cats out there with severe dental disease that desperately need treatment. Most owners are unaware of their cat’s teeth problem until either a vet checks the animal’s mouth, or the mouth becomes so sore and breath so foul that the owner’s attention is drawn to it. Cats can suffer from a number of different dental problems, but one of the most common is what is known as a feline odontoclastic resorptive (FORL) lesion. These are essentially cavities like humans can suffer from, though they are formed slightly differently and can occur in any tooth. The most commonly affected teeth are the lower premolars. Another very common presentation is the presence of gingivitis, simply meaning inflammation of the gums where the gums meet the teeth. Gingivitis can be a reaction to bacterial infection, or as a result of a viral infection such as feline calicivirus. Are some cats more likely to get dental disease than others? Yes. Brachycephalic (short nosed) breeds such as Persians often suffer from dental disease, though any cat can do so. 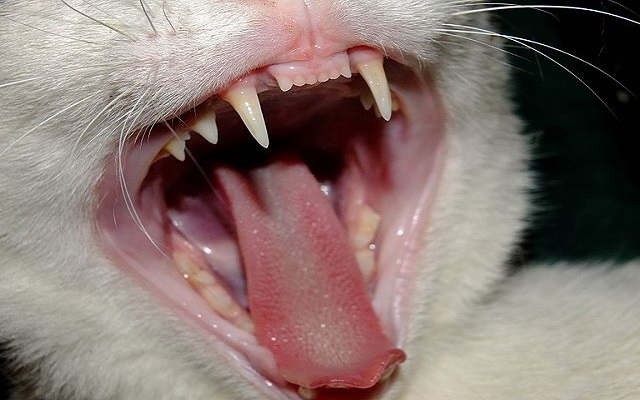 Older cats tend to have more teeth problems than younger cats because tartar builds up with time. Outdoor cats that hunt tend to have good teeth because crunching through the bones of mice and other prey helps clean their teeth. Any good vet will check a cat’s teeth thoroughly as part of a routine annual vaccination check up to advise whether any dental treatment is necessary. Clearly, diet plays a major role in the development of dental disease. Cats that eat a dry biscuit-based or complete diet are less likely to get dental disease compared with cats on wet tinned food merely because crunchy hard food helps to stop tartar attaching to the teeth. However, diet alone is not enough for some cats and brushing may be necessary if you are to avoid the prospect of dental scaling and polishing under general anesthetic further down the line. How do I know if my cat has dental disease? 1. Discoloration of the teeth, with yellow or brown tartar (known as “calculus”) adhering to the teeth, mainly on the cheek side. 2. Reddening of the gums (known as gingivitis). 3. Recession on the gum to expose some of the tooth root. 4. Presence of cavities (FORL lesions). 6. Dribbling more than is usual. 7. Difficulty eating dry biscuit type foods. How do I go about brushing my cats teeth? Firstly, buy a suitable toothbrush. Human toothbrushes are usually too hard for cats, though can be used if they have soft bristles. Ideally, you want a toothbrush with a long handle and an angled head to better fit the mouth, and extra soft bristles. An alternative is using a finger brush, which fits over the tip of your finger. Next, find a suitable toothpaste. Cats do not really like the mint taste of human toothpastes, so the whole operation will run more smoothly if you use a toothpaste designed for pets. Some pet toothpastes come in meaty flavors so that your pet enjoys the experience. These pet toothpastes usually contain enzymes that help control plaque. Fluoride may be incorporated to help control bacteria. Tip: try placing the toothpaste between the bristles if you can rather than on the top of them, as this will achieve better cleaning. Now you have the equipment, try brushing the teeth. Most pets will accept this if you are gentle. It is much easier if you start when they are kittens so that they are accustomed to the procedure, but even older cats can grow to accept it. The outside of the teeth (the cheek side) is the most important to clean, as the cats tongue helps clean the inside of the teeth to an extent. The toothbrush bristles should be placed where the teeth and gums meet at a 45-degree angle. The movement should be in an oval pattern. Try to gently force the bristle ends into the area around the base of the tooth as well as into the gap between the teeth. Aim for ten short back-and-forth motions, covering several teeth at a time, then move the brush to a new location. When starting for the first time, do it twice daily without toothpaste for 1-2 weeks. This way your cat will become familiar with the feel of the brush quickly, and you can then start doing it with toothpaste. In the long term, once weekly brushing is usually adequate. My cat already has a rotten mouth. Need I be worried about getting his or her teeth done at the vets? As long as your cat does not have a pre-existing heart or respiratory problem, you need not be worried. Even if they do, chances are your cat will be fine. Dental scaling and polishing is done on a daily basis at many veterinary clinics, and does not have any risks in itself beyond the anesthetic risk that exists with every general anesthetic. Many clinics will do pre-anesthetic blood tests for geriatric patients as a matter of protocol, to check on their liver and kidney function. If your cat has severe dental disease or FORLcavities, he or she may require teeth to be extracted. This is not something you should worry about in itself, as it is much better for your cat to have no tooth than a painful tooth. Many cats can eat dry food comfortably without any teeth at all as they tend to swallow biscuits whole rather than chew them anyway. If you think your cat might require professional dental treatment, you should book an appointment with your vet as soon as possible. Many cats develop a new lease of life when their mouth suddenly becomes pain free, it may be the greatest gift you could ever give your pet.